Dr. Lewis Dodgson was the head of research at Biosyn. He was known for his law-breaking studies, including a rabies vaccine test conducted on farmers in Chile without their knowledge of consent. However, Dodgson was able to escape prosecution, mainly because he had conducted this test in a country where he could not be hampered by rules and regulations, and the Americans did not have jurisdiction. Originally, he had hired Dennis Nedry to steal embryos from Isla Nublar so that Biosyn could clone its own dinosaurs. However, when Nedry failed Dodgson prepared to locate InGen’s Site B and collect dinosaur eggs. He collected a team that included Howard King and George Baselton. 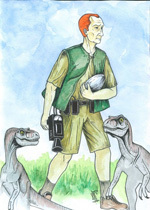 Upon arriving on Isla Sorna, Biosyn’s team started collecting dinosaur eggs using a sonic device Dodgson used to deter the dinosaurs. However, during the attempt to steal Tyrannosaurus Rex eggs Dodgon’s machine failed. Baselton died, and Dodgson fell off a small cliff, knocking himself out in the attempt to escape death. He awoke later to find Procompsognathus attacking him, and was able to seek refuge in a shed. Upon waking later he discovered the electric car that Sarah Harding was hiding under. Prepared to steal it and escape the island, Dodgson was attacked by Harding and then captured by a Tyrannosaurus. Led to the nest, Dodgson was presented to the rex infants as their first hunted meal.